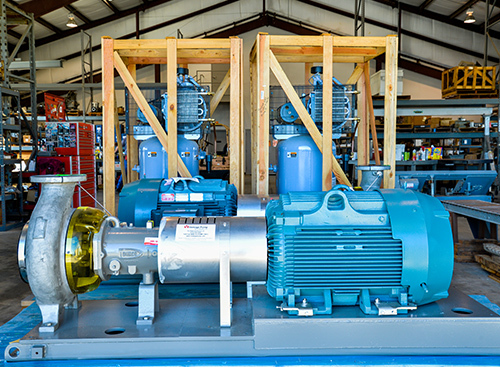 Vantage Pump and Compressor, Ltd. carries a wide selection of commercial and industrial pumps. All equipment is tested to meet the highest standards in efficiency, design, and quality. Our pumps are used in a variety of applications from the medical industry to the South Texas oil and gas fields. At Vantage Pump, we are committed to doing much more than just supply and service your equipment. We are focused on developing engineered solutions to meet unique industry challenges for each of our clients. We also provide preventative maintenance programs, repair services, and much more to keep your pump at optimal performance. Pump problems? Pump offline? Leaky pump? Noisy pump? Pump not performing? We are your solution! We troubleshoot these issues to determine the best course of action for your situation. By providing industrial pump service and equipment with an extensive inventory, we are confident we have a solution for any problem. At Vantage Pump and Compressor, Ltd, we understand properly working equipment is the livelihood of any business. Give us a call to talk to one of our knowledgeable team members and get your industrial facility up and running promptly.